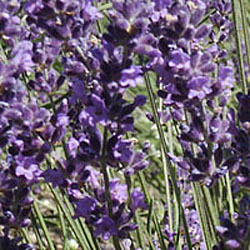 This cultivar of English lavender is excellent for both fresh cut and dried flowers. It is slightly taller than other dark colored cultivars like 'Hidcote' and 'Loddon Blue'. It blooms lightly again in late summer. The calyx color is dark purple; the corolla is violet. One our top 10 favorites. Categories: All Items, all potted plants, bee nectar plants, butterfly nectar collection, culinary herbs, deer resistant, dried flowers, lavender plants, Potted Plants, More..